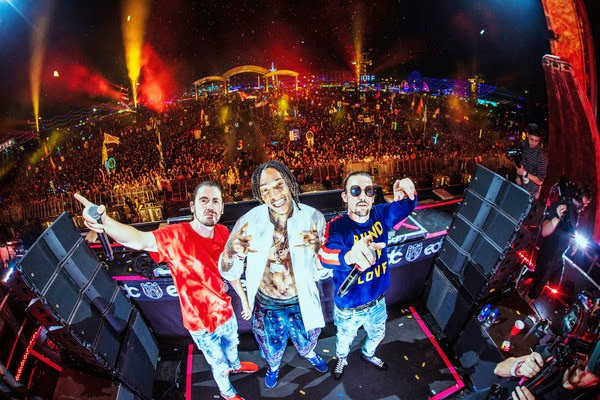 MUMBAI: Belgium superstars Dimitri Vegas and Like Mike was joined on stage by rap icon Wiz Khalifa at EDC Las Vegas 2018 for the debut performance of their upcoming single When I Grow Up. The surprise guest joined them during their Friday night set at kineticFIELD, the largest stage at EDC Las Vegas. Wiz Khalifa is the latest addition to Dimitri Vegas and Like Mike’s growing list of A-List collaborations. EDC 2018 is the kickoff of the internationally acclaimed duo’s jammed packed summer schedule, including their second mind-blowing residency Garden Of Madness at Ushuaïa Ibiza. The Belgium-born Thivaios brothers have expanded globally as a top-draw live act after conquering Europe over the last decade. As recording artists, Dimitri Vegas and Like Mike have collaborated with the likes of Gucci Mane, Ne-Yo, Diplo, David Guetta, Kiiara, legendary composer Hans Zimmer (for an official Pirates of the Caribbean track), and most recently Steve Aoki and Oscar-nominated actress, Abigail Breslin for their momentous collaboration We Are Legend. The brothers have scored two No. 1s on Billboard’s Dance Club Songs chart and were the first-ever duo to be named No. 1 DJs in the world by DJ Mag’s annual Top 100 Poll. MUMBAI: Madonna’s highly-anticipated 14th studio album Madame X will be released on 14 June 2019 globally from Live Nation, Interscope Records and Maverick.